The vSphere Web Client contains useful filtering options. One of them is to create a filter based on the virtual machine compatibility. This makes it easy to find virtual machines that need an upgrade to the latest virtual hardware version. Just enable the filter (see image below) and select all compatibility modes except the latest one (in this example vmx-10). You will only see virtual machine levels in the filter based on the virtual machines in your environment. If you don't see hardware level 9 for example it means that there are no virtual machines with that hardware level. To make it easy to see what virtual machines have which version you can enable the compatibility column by right clicking the column headers. To upgrade the virtual machines they must be powered off. When they are powered off select the virtual machines to upgrade, right click or select Actions in the top-bar and choose All vCenter Actions -> Compatibility to upgrade the hardware level to the highest level that is supported by your host. 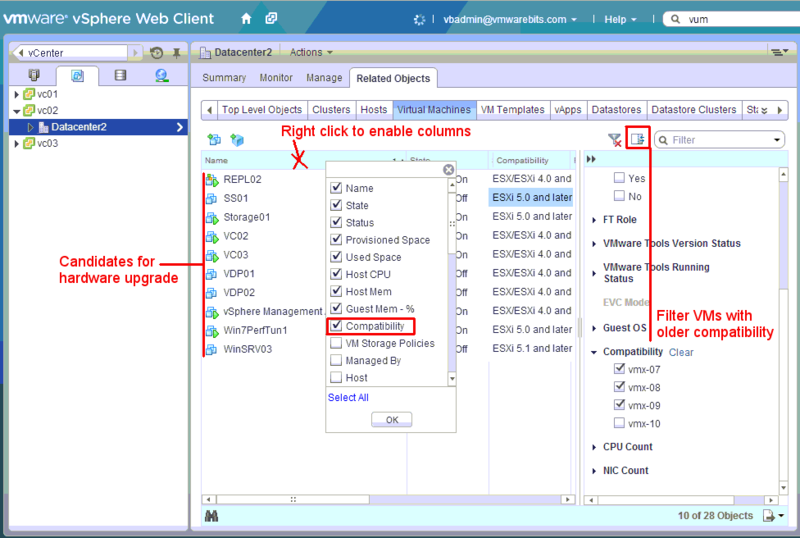 On a vSphere 5.5 host your virtual machines will be upgraded to hardware level 10. Tip: You might also need to upgrade the VMware Tools if you haven't done that already and the best choice is to first upgrade the tools and then upgrade the hardware.